We attended the Lake Shore Fireworks Celebration on Friday, July 2. There were carnival rides, entertainment, and fireworks. The festival continues through July 4 with an additional fire works display on Saturday, July 3. Last year we attended on the preview night with no fireworks and a chance of rain all night and the crowds were much more manageable. 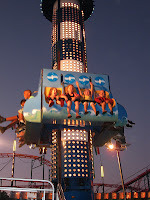 My daughter enjoyed the rides, although I felt that there were more for younger children last year. 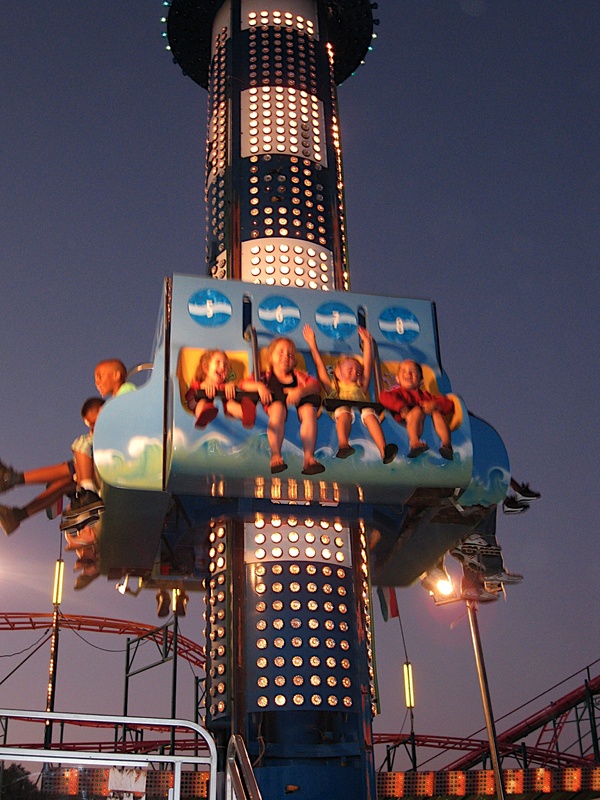 This year, she just barely made the 42″ height limit so she was able to ride a few extra rides without an adult. We bought her an $18 unlimited ride wristband. Tickets were 4 for $5 or 20 for $20, but we did not buy any. Her favorite rides were the canoes and the lighthouse jumper. She rode each twice. She really enjoyed riding the canoes last year and could not wait to ride them again. Last year, the canoe course was longer and the canoes moved a little faster. She had a wonderful time on the rides. We opted to buy dinner at the festival. There were three food trucks, only one of which offers dinner type of foods – hot dogs, sausage, cheesesteak, chicken fingers, etc. The line for food was extremely long most of the night (7:30-10p). The cotton candy, popcorn, caramel apple line was relatively short. When we were ready for dessert the funnel cake, elephant ears line was quite long. They could have had a few more food trucks or other food options and still maintained lines. Next year, we will be sure to eat dinner before attending the festival. The art and craft tents were fairly minimal and not worth a trip if that was your point in attending the festival. The porta potties were under equipped. They had no toilet paper or hand sanitizer available. The fireworks are viewable from the parking lot with many people watching from in front of or on top of their cars. We were lucky that cars had left next to our friends and we were able to spread blankets and chairs out between cars. The fireworks celebration was scheduled to begin at 10:15, but didn’t start until after 10:30. We packed our car up as the fireworks were ending and pulled out a minute or so after the show ended. It took us over 30 minutes to exit the parking lot. Because we had arrived early to attend the festival, we were close to the carnival, and far from the exit. The security guards were doing an inadequate job of controlling the traffic flow. We were sitting and moving one car length every 3-4 minutes and watching other lanes move continuously. The problem was that 7 lanes were merging into our lane prior to the final merge and the other lane in the final merge had maybe 2 lanes merged into it (and was being allowed to move 20 cars to 7 for us). There was a single one lane exit back onto Bridge St and they forced you to go south. If we do go to the festival next year, we will either skip the fireworks, or leave prior and find another place to watch them. Overall, we had fun at the festival and might return next year, possibly on the preview night. But the long lines for food will cause us to eat prior to the carnival. We also will not stay for the fireworks because of the poor crowd control. This is only the festival’s second year so hopefully they can make improvements to the parking/exiting for future years.